The Center for Identity and Inclusion bases its philosophy on inclusion and fostering recognition and respect for the voices of all students. 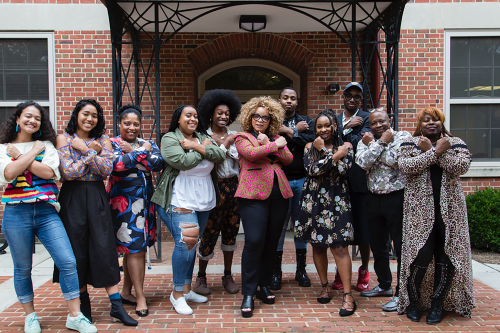 Located in Fox 110, the Office is home to the Mentoring Network, a personal support program for African American, Latinx, Asian American, International, and LGBTQ students. Center for Identity and Inclusion (CII) Programming Committee plans and coordinates programs that serve the cultural needs of MICA's Community. Throughout the year there are a variety of opportunities including educational and social activities that are planned and tailored to promote the improvement of academic success and graduation rates of artists of color. The Center for Identity and Inclusion is committed to the needs of future generations of artists, designers, scholars, and educators. By facilitating, supporting, and promoting cross-cultural awareness, dialogue and interaction, the Center for Identity and Inclusion fosters inclusivity and understanding for the entire MICA community. We embrace a notion of a global society enriched and enhanced by diversity where information, knowledge, beliefs, and identities of every individual and all groups are freely and openly shared and respected. Through curriculum, accessibility, and policy, we strive to create programs and initiatives that will enable students to become capable critical thinkers and well-informed artists who are better prepared to function effectively in an increasingly complex and diverse global society. Achieve access and equity for historically underrepresented groups at MICA. Encourage diversity initiatives that enhance student recruitment, retention, and engagement of diverse students throughout the college. Initiate on-going education and training around creating an inclusive community for students, staff, and faculty. Strengthen institutional partnerships that enhance the interests of the MICA and Baltimore communities in the area of diversity and inclusion. Leverage skills and knowledge to increase capacities for leading with a cross-cultural lens. Demonstrate one’s own identity, culture, and heritage through their art-making practice. Discuss the history and patterns of difference, discrimination, and oppression with regard to different groups, including, but not limited to, race, ethnicity, gender, sexual orientation, class, ability, and culture. Apply skills and knowledge to lead with a cross-cultural lens and develop a personal framework for inclusive leadership. Use advocacy and change management skills for achieving social equity. MICA's Center for Identity and Inclusion supports a number of student-lead activities and other diversity and inclusion initiatives like mentoring networks, diversity grants and resources, History/Heritage Months, and annual events like the Annual Benefit Fashion Show. Click the link below to explore the Center's supportive resources and our network of mentors. Each year funds are generated from ticket sales of the yearly benefit fashion show sponsored by the Center for Identity and Inclusion. Profits from the fashion show benefit student participants in the Center for Identity and Inclusion. At MICA, we believe no aspect of a person’s identity is grounds for excluding them from opportunity. The Mentoring Network is a personal support program designed especially for incoming freshmen and transfer students. Every academic year, the Center for Identity and Inclusion honors the following history/heritage months through active and passive programming for the MICA community. The Center for Identity and Inclusion Newsletter, The Plug, is a monthly, opt-in, electronic bulletin that highlights various on- and off-campus events and suggests relevant and/or timely literature to the MICA community around the topics of diversity, inclusion, and equity during the academic year.